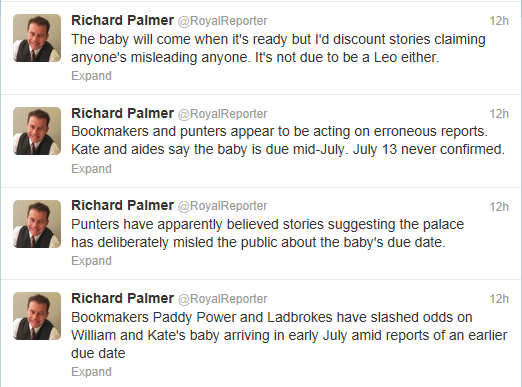 Is Kate lying about her due date? There are new reports that Kate could be lying about the due date for her baby and that she could be due ten days earlier than has been previously reported. It was first reported that she was due in July, then they narrowed it down to mid-July, then some media outlets were saying anywhere from July 13-15 (I’ve seen different outlets say different days, so I’m not sure). Well now the Telegraph has a story about how Kate could by lying and that they think she’s actually due in the first week of July. Apparently Diana told everyone that her due date was July 1 (with William), but she delivered ten days early, on June 21. They keep harping on the fact that Kate refused to attend the Percy wedding last weekend (and instead went shopping) because she was afraid she would deliver early; but as I’ve said previously, I think that was just a fib so that it wouldn’t look bad when she didn’t attend when the real reason was the Percy’s didn’t want her there. Of course, Kate has been so thin throughout her pregnancy that if she is due earlier than previously thought, my god she is tiny for a nine months pregnant woman. Seriously. If you were to tell me that she was due later than previously reported, I’d totally believe you since she looks nowhere near the end of her pregnancy. I’ve thought for a while that Kate would deliver earlier than mid-July, and my suspicions were only intensified when the palace released information that said Kate did not plan to have a cesarean and wanted a natural birth. I think she WILL plan a cesarean for early July, and that they will release a story about how Kate had some emergency and they had to get the baby out early or else. I thought that might happen over the same weekend as the Percy wedding, but it didn’t. There was some random RAF helicopter that was flying around the Percy castle that sent everyone into anxiety about whether or not Kate was in labor and the helicopter was there to take William to London, but it wasn’t. It did freak everyone out, though, and caused Kate to pull some focus away from the wedding. I have no idea if that helicopter stunt was planned by the Middleton’s, it probably wasn’t, but it was still kind of funny and I am totally going to claim that as a victory for my own predictions—they were just a slight bit wrong. Back to topic: I think it is more than a possibility that Kate delivers early. Not because she’s lying about her due date, but because she’s lying about wanting a natural birth and will lie about the circumstances surrounding the birth. Call me a skeptic but there have been far too many weird things about Kate’s pregnancy for me to assume any less than the most drama-filled deliver ever. To bad the Home Secretary doesn’t still have to witness the birth [number 3], then there would be no skepticism involving the birth of this child. In case anyone is wondering, I don’t want to post photos taken from articles because those are copyrighted and I did not pay to use them so I don’t, because I don’t want to get in trouble for using a copyrighted image I didn’t pay for. This picture is a screen grab of Richard Palmer’s twitter account that I took myself so I feel like I can post it. Images would have been nice, especially for the wedding fashion post, but I don’t want to get in trouble. Even though this is such a small blog that no one would notice, I still don’t want to take that chance. Comments Off on Is Kate lying about her due date? « TV presenter wants Kate to breastfeed in public: good idea or unneeded drama?